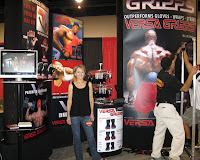 Versa Gripps launched their new booth at the Olympia Expo 2008. Our new display features Jenny Lynn 2007 Figure Olympian, Pro Rob Brown and Joel Stubbs IFBB Pro Bodybuilder. Joel Stubbs is known for having one of the “best backs” in bodybuilding history and is a huge fan of Versa Gripps. Thanks to everyone who came by our booth to see us and we hope to see you at the Arnold Classic in 2009. This entry was posted on Monday, October 27th, 2008 at 11:10 am	and is filed under Uncategorized. You can follow any responses to this entry through the RSS 2.0 feed. You can leave a response, or trackback from your own site.